Opening 10.03.2017 from 7.00 p.m.
Press conference: 10.03.2017 from 11.00 a.m.
Scandinavian studio jewelry is inconceivable without her and her works. 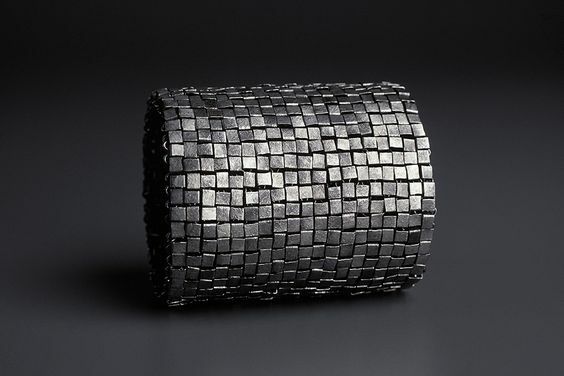 As early as the beginning of the 1960s Tone Vigeland’s jewelry objects were routinely included in what are today legendary publications and exhibitions, such as the International Exhibition of Modern Jewellery held 1961 in the Goldsmiths Hall London, which first familiarized the public with the emerging art style of studio jewelry. 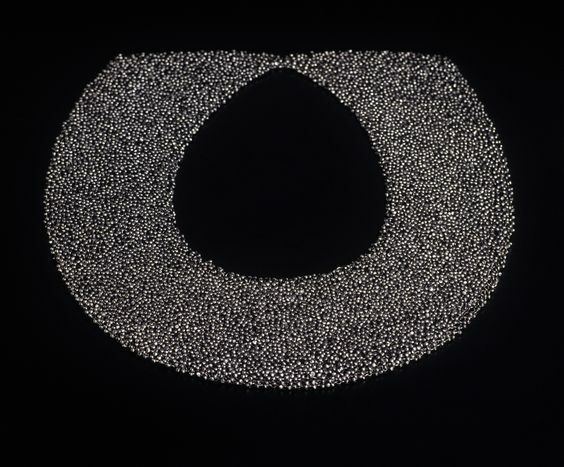 Now, to mark her 80th birthday, Die Neue Sammlung is devoting its first solo exhibition in Europe outside Scandinavia to the grand dame of Scandinavian studio jewelry – 50 years after Vigeland’s first solo exhibition in 1967 in the Kunstnerneshus in Oslo. With their flowing shapes Tone Vigeland’s pieces generally fit snugly despite being made of metal. Vigeland oxidizes the light shiny silver until it is as black as iron. Through contact with the skin the silver regains its play with the light, and lent and dreamt of metallic color variations. Every piece becomes individualized through virtue of being worn. 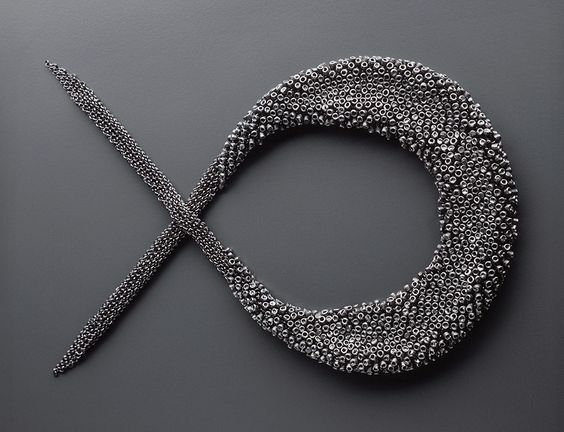 Though they stand out for their size and volume, the objects consist of an incredibly large number of tiny hand worked parts – minute pipes twisted from silver wire, precisely cut rectangular and round discs or tiny pellets and rings – so cleverly joined together as to be invisible to the naked eye. Tone Vigeland’s art on the body appears simultaneously modern and archaic. Born 1938 into one of the most famous artist families of Norway Vigeland’s artistic training began 1955 at the Statens Håndverk-og Kunstindustriskole Oslo (today Kunsthøgskolen in Oslo, National Academy of the Arts). To learn goldsmith work she moved 1957 to the Oslo Vocational School. 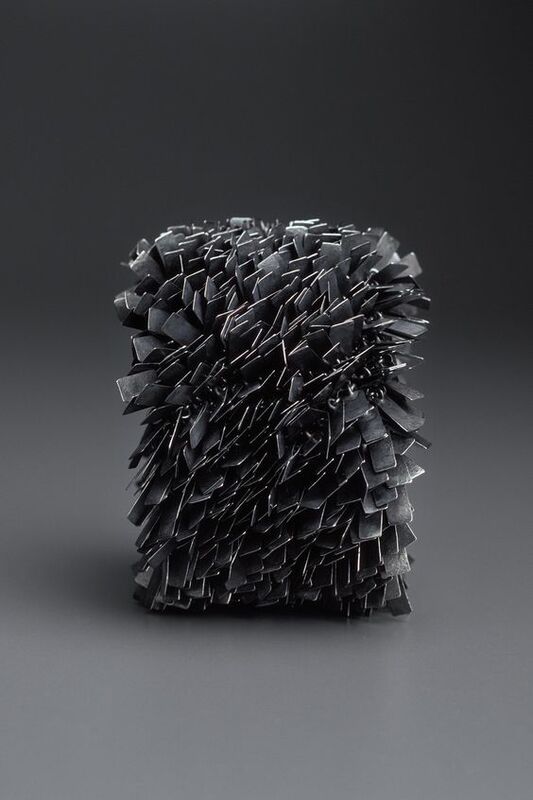 In 1958 she joined the avant-garde artist cooperative Plus in Frederikstad, where several of the works she designed as a student were produced in series. Earrings worked from a single silver loop, whose restrained simplicity and linearity was typical for the style in Scandinavia after World War II, were successfully produced until 1985. 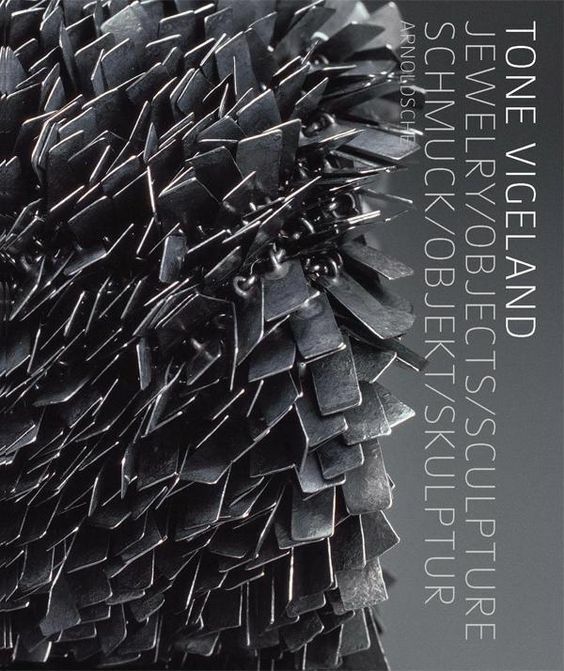 In 1961, Tone Vigeland opened her own workshop, and began producing one-offs. Since then she has produced many world-famous items of jewelry which have been honored with numerous distinctions. These are now on show for the first time in a solo exhibition featuring 150 of her works. In a high-profile exhibition in Galerie Riis 1995 in Oslo, Vigeland took an important step into a different dimension – namely art in architectural space – and simultaneously a move away from decorative art that cites the human body. This move from the body to free space seems a huge one, and yet was quite a logical step for Tone Vigeland. The very highest distinction have accompanied the artistic oeuvre of this extraordinary Norwegian artist: the Prince Eugen Medal from Sweden in 1988, appointment as Commander of the Royal Norwegian Order of St. Olav in 1996, the Anders Jahre Art Prize and in 2008 she received the Golden Ring of Honor from the Association for Goldsmiths’ Art in Hanau. The exhibition was realized with the kind support of the Norwegian Ministry of Foreign Affairs in Oslo, the Royal Norwegian Embassy in Berlin, the Royal Norwegian Consulate in Munich and the Danner-Stiftung, and in cooperation with Norwegian Crafts, Oslo. In January 2018 the exhibition will be on show in Nordenfjeldske Kunstindustrimuseum in Trondheim.